A Clothes Valet Stand for the Perfect Gift! Home / A Clothes Valet Stand for the Perfect Gift! Mahogany By Hand has been Melbourne’s leading antique reproduction furniture producer for more than 45 years. We handcraft timber French and English reproduction furniture for every room of the home, as well as for a range of commercial customers.Notably, Mahogany By Hand has an extensive catalogue of bedroom furniture items, including a popular range of valet stands. We have an extensive range of mahogany valet stand, clothes valet stand in both contemporary and antique styles. It is very difficult to find a valet stand Australia wide, let alone procure a good quality clothes valet, as many of our delighted customers will attest to. We e have many to choose from and all of our valet stands are fully hand made & of exquisite quality. The timber is kiln dried mahogany. These items, as with all of our products are covered by our lifetime guarantee. We can offer you various designs of mahogany valet stand. There are antique valet stand, contemporary valet stand, chair valet stand and more! To see our collection of mens valet stands, or for the full range of items that can be custom-finished to your specifications, view our catalogue or contact Mahogany By Hand today. We custom-finish all of our bedroom furniture to match your décor and taste. As such, our men’s valet stands can be finished to suit your personal taste, colour scheme and existing furniture finishes. You first select the make of your clothes valet stands, followed by the timber finish, and, if desired, highlights in gold, silver or any other finish. For bedroom items that have an upholstery option, you can select from our extensive range of fabrics or even provide your own fabric to match existing furniture. As with all of our furniture, Mahogany By Hand’s clothes valet stands are hand made from timber that has been kiln dried, ensuring lasting quality: no splitting, twisting, or cracking. Our mahogany valet stand – as with all of our products – are backed by a Lifetime Guarantee, giving you assurance that our workmanship is of the highest standard. 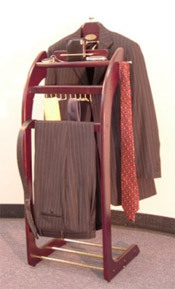 So if you are looking for a valet stand Sydney or Melbourne, please view or full range here. Our clothes valet stand will hold jackets, shirts, trousers and shoes, letting them air and ensuring that they don’t crease or wrinkle. One model of our clothes valet stands also includes drawers for storing accessories such as cufflinks, watches, belts, and wallets. A perfect complement to one of our chests of drawers, armoires or dressing tables, our men’s valet stands help you keep organised and prepared. To have a furniture specialist speak with you about our men’s valet stands and other quality bedroom furniture, please use our enquiry form to contact us or call us on (03) 9555 1210.